International Journal of Research in Health Sciences,2014,2,1,326-330. 1- Associate Professor, 2- Post Graduate, 3-Professor and HOD, Blood Bank, Upgraded Department Of Pathology, Osmania General Hospital-Hyderabad Telangana, INDIA. Blood groups are genetically determined and exhibit polymorphism where different population groups have significant difference in the frequency of each blood group. ABO blood group system and Rh blood group system both are most important for blood transfusion purposes. This study was conducted to determine the frequency of ABO and Rh blood groups in a tertiary care teaching hospital at Hyderabad. Retrospective study was conducted at blood bank and for a period of 4 years from June 2009 to May2013. Total 15,740 donors were tested by commercially available standard monoclonal antisera by slide and tube agglutination technique. Out of 15,740 donors; 15,384 (97.73%) were males and 356(2.27%) were females. The commonest blood group was O, followed by B, A, AB groups. 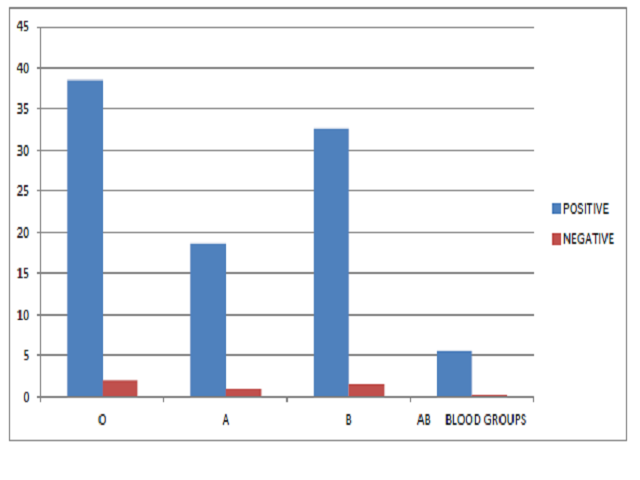 In Rhesus grouping 15,012(95.37%) donors were Rh positive and 728(4.63%) donors were Rh negative. Majority of donors were in the age group of 21 to 40 years. The study has a significant implication in the effective management of blood banks.